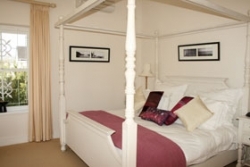 Our honeymoon suite is a tranquil Triple Aspect Sunny Bedroom with a magnificent Four Poster Bed with spectacular Lake/Garden and Pool Views. The French doors open up onto one of our terraces where you can relax and enjoy your lavish breakfast or sip on a refreshing cocktail as the sunsets. Our Honeymoon Suite is a large, bright and airy room with built in wardrobes, side tables with lamps, chandelier, and writing desk. Air conditioning, satellite TV and private mini safe. The luxury en-suite bathroom boasts a Jacuzzi bath, separate shower and heated towel rails. Free standing washbasin and w.c.
For the more private romantic getaway or should your family favour a private beach holiday, we have a separate and private beach villa available for rental with its own pool. For the idyllic small wedding we offer great individual wedding packages where you can have a romantic beach wedding or an idealistic garden wedding under the gazebo in our gorgeous gardens. Serenity on the Lake is a convenient Cape Town small wedding venue. Please contact us to arrange your wedding. With so many things to do and so many local attractions in the area we are pleased to assist you with pre-booking your tours whether it is a trip to Cape Point, ride in the cable car up Table Mountain, or a nostalgic trip around the historical naval village of Simons Town. Maybe you prefer a scenic trip through the world famous Cape Winelands or a round golf at one of the many world renowned golf courses in the area. For the nature lover we would be pleased to arrange horse riding on Noordhoek Beach, shark diving and surfing. The area is also well known for whale watching and you can spot many dolphins and penguins. Your friendly host will be more than happy to discuss all your arrangements with you and to assist you to plan a memorable visit.